Sweet Baby Ray! And no I am not talking about the barbecue sauce. 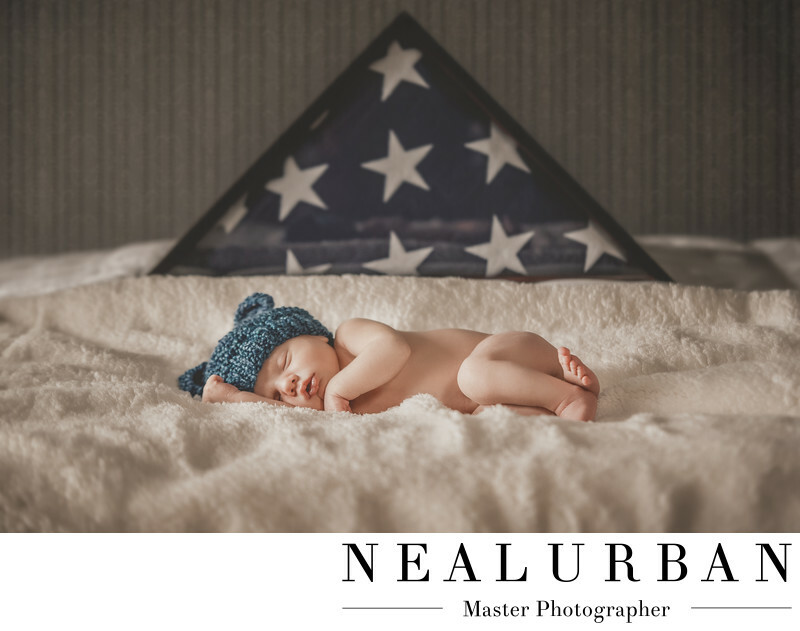 This newborn session at Neal Urban Studio was great! Meet Ray! Baby Ray was the best sleeper. I do not think he woke up once during the entire shoot. That was a bonus for us. We loved the ideas mom brought to the table for this newborn session. Her grandfather was in the military and when he passed away, the flag went to her mother. Ray was also named after his great grandfather! It seemed only natural to have the flag presented to the family in the photo of the baby. We really wanted that to be a focal point in the photo. We know the baby really is, but the flag is still pretty prominent. We loved how Ray's sleeping on his little arm too. He did that himself when we put him down on the blanket. We did this on a bed we have in the studio, so we didn't need any extra cushion. We knew he wasn't going to fall off or be uncomfortable. His little knitted hat was so cute too. We were going to take it off of him, but he looked too precious to disturb. And we do love accessories, so it had to stay. After this amazing newborn session, Baby Ray came back a year later for his first birthday cake smash session! Location: 2495 Main St. Buffalo NY 14214 Unites States.